Issue : Suppl 1 Issue sponsor : Publication of this supplement was funded by the Society for Cardiovascular Magnetic Resonance. This article is published under license to BioMed Central Ltd. This is an Open Access article distributed under the terms of the Creative Commons Attribution License ( http://creativecommons.org/licenses/by/4.0), which permits unrestricted use, distribution, and reproduction in any medium, provided the original work is properly cited. The Creative Commons Public Domain Dedication waiver ( http://creativecommons.org/publicdomain/zero/1.0/) applies to the data made available in this article, unless otherwise stated. [Evaluation of patients with cerebral infarction using transesophageal echocardiography: atherosclerotic changes in the thoracic aorta and the branches of the aortic arch]. 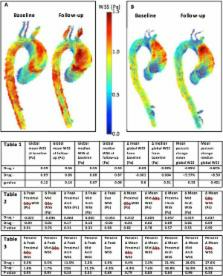 Effect of descending thoracic aorta clamping and unclamping on phasic coronary blood flow.